Big Time Race Announcement! | Keep It Up, David! Nancy shared that she read my blog, found my story inspiring, and was delighted that I chose her event as my first race. She asked if I was planning on running it this year, and, if so, would I consider starting the race? Would I consider starting the race?!? Would I consider firing the starter pistol or blowing the air horn (or whatever they use) that gets over 2,000 runners racing? HELL YEAH I WOULD! What an honor to be asked! It was this email that prompted my return to running, and I’ve been working on getting back in to running mode ever since. The race is the weekend after next – November 4th – not that far away at all! The reason why I haven’t shared any of this yet is because Nancy initially asked me to hold off. She was going to pair me with a celebrity to start the race (!! ), but that hadn’t been finalized yet. So I held off until I heard more. When I did hear more from Nancy, last week, the plan had changed. They had been talking with folks over at Fox about getting Max Greenfield to start the race with me. Have you seen “New Girl”? Max pays Schmidt, a role that earned him an Emmy nomination earlier this year. But the Fox folks were insistent that Max start the race by himself. They didn’t want him sharing the stage with anyone. So… I was out as official race starter. I’d been shafted by Schmidt. Here’s the thing: I hold no ill will towards Max Greenfield. It’d be easy to hold a grudge against a big time television star that I’ll likely never, ever meet, but it probably wouldn’t last long, because I’m a fan of “New Girl,” and watch the show every week. Plus, I know a thing or two about how publicists work, and chances are the Fox publicity team didn’t even tell him about the event until they got all the details hammered out, and starting the race solo was just one of those details. I’d like to think that Max might even be open to having someone start the race with him. First of all, he seems like a cool guy, based on interviews I’ve seen. Secondly, fitness seems important to him. I’m guessing he works out a lot, because he’s shirtless frequently on “New Girl,” and he is ripped. And I know for a fact that he competed in a triathlon last month, because I saw a picture on the internet. Lastly, he might feel a connection to my story. His “New Girl” character, Schmidt, used to be a lot heavier, and at some point, Schmidt lost a ton of weight. They’ve even shown flashbacks where Max is all decked out in a fatty suit. But that’s all speculation and wishful thinking. And, really, I’m burying the lead, because I will still be involved in this year’s weSPARK race. Nancy, the Executive Director, was incredibly apologetic about how the whole race-starting thing went down, and asked if I would consider being a part of the awards ceremony. They want to call me up onstage and highlight my story, and then I’d help pass out medals to the winners. HELL YEAH, THAT’S AWESOME TOO! It doesn’t matter what I’m doing, I’m still ridiculously honored to be a part of this race. I wouldn’t let some dumb change of plans sour my attitude. Nancy at weSPARK is a lovely, fantastic woman that I’ve enjoyed talking with, both via email and on the phone, and if she wanted me to show up and collect trash, I’d do it. In addition, this whole series of events has invigorated my workout routine, and that’s a big deal. I’ve been regularly running after work so I’m prepared for the race, and it’s been the most after-work exercise I’ve gotten in the past couple months. Just last night I hit the streets of Hollywood while listening to the Presidential Debate on NPR (which turned out to be better running accompaniment that I was expecting), and I logged a nice 43-minute outing that included some steep hills. Lastly, it feels good to be involved with charitable endeavors. I think I raised over $500 last year for weSPARK, and that’s nothing to sneeze at. I set up a fundraising page for this year’s event, and set $500 as my goal. I’m getting a late start on the fundraising, since the event is less than 2 weeks away, but if you’d like to make a donation, you can click here to be taken to my personalized page. Donations benefit weSPARK Cancer Support Center, which is dedicated to enhancing the quality of life for cancer patients, their families and friends. weSPARK provides, free of charge, multiple services designed to heal the mind, body and spirit of all those whose lives have been affected by cancer. 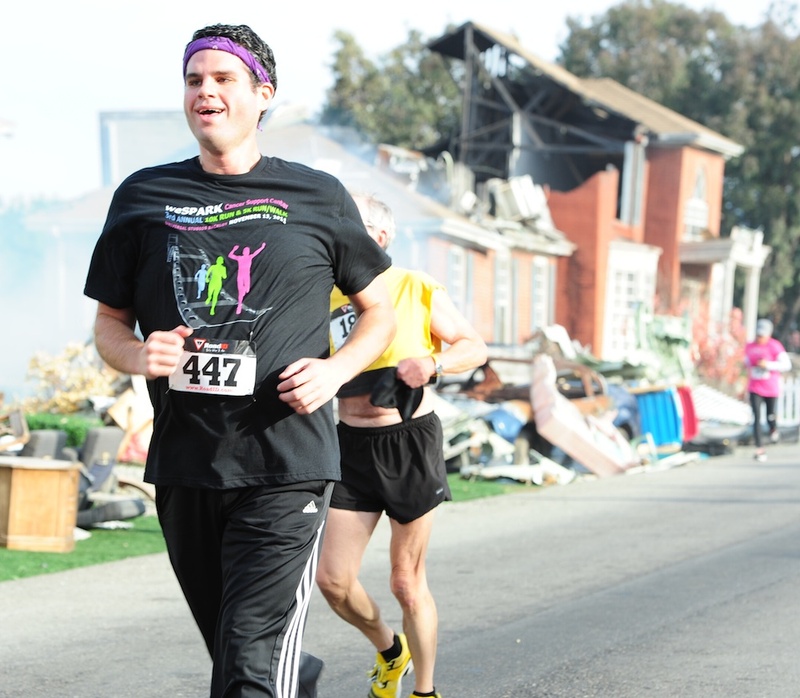 And if you’re in the Los Angeles area and want to register to run in the event, click here. In addition to the 10k, there’s also a 5k run/walk. It’s going to be a lot of fun… and hey! You’ll get to see Max Greenfield start the race and me helping to pass out the medals! This entry was posted on Monday, October 22nd, 2012 at 11:45 pm and is filed under Uncategorized. You can follow any responses to this entry through the RSS 2.0 feed. You can leave a response, or trackback from your own site. 6 Responses to Big Time Race Announcement! Send this blog to Max Greenfield!! I’ll be there again this year doing the 5K walk! Hope we are able to run into each other again!